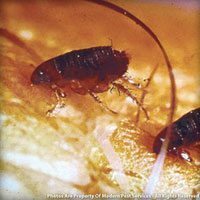 Adults cat fleas are about 1/8 of an inch (2.5mm) long. 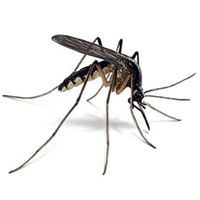 The body is flat laterally from side to side and has no wings. 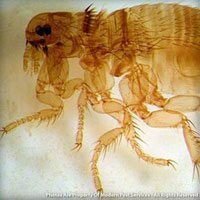 Cat fleas are dark brown or black and turn red when full of blood. 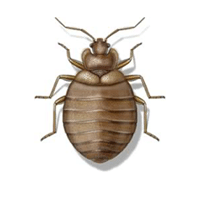 Fleas can jump about 6″ vertically so they can easily hitch rides on legs and bodies of cats, kittens, and even humans. Adults will begin to seek blood after the second day of birth but can live several months from the fat stored on their body. 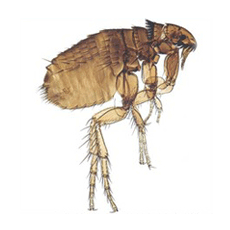 Cat fleas may transmit plague and there is very strong evidence that they may transmit typhus. Females lay 4-8 eggs after each blood meal, which means females can lay over 400-500 eggs during their lifetime.